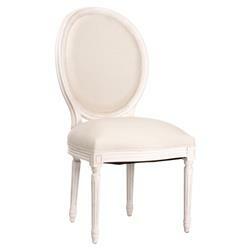 The comfort and elegance of French Country style shines through in this opulent oak chair finished in antique white. Crisp, white cotton upholstery adds luxurious comfort over the seat and back. The slim silhouette is perfectly proportioned for smaller sitting areas and dining rooms.